I hope you enjoy this little slideshow of pics I put together. You can watch the YouTube video, or just scroll down to the photos and descriptions. This is going to be a seasonal post where I hope to share new ideas with you. And I will also be using a link option for you to share your ideas here as well. Yes, I'm still talking fall. I have to do Thanksgiving first, then I will focus on Christmas. I can't help it! So if you are looking for some ideas for bringing a touch of autumn into your home and to the table. I have some inexpensive solutions for you. I really enjoy creating displays, photography and now I've been learning a little photo editing using actions and textures. I do have sooo much to learn so bear with me. I'm new at this! 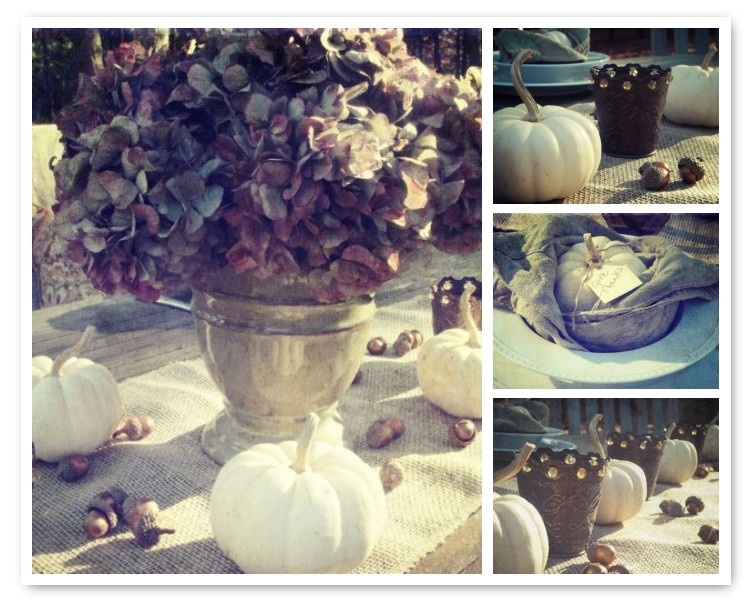 A simple row down the center of your table using candles, pumpkins and acorns. Love it! The pumpkins look very cute and cozy nestled in a folded napkin at each place setting. Here I tied on a message tag with some jute - they can also be your place cards. 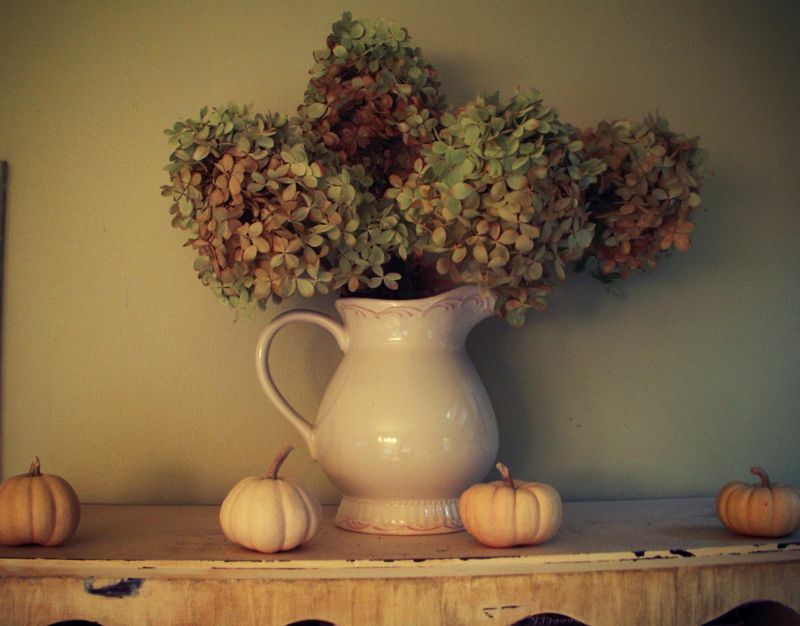 Dried Limelight Hydrangeas...and white pumpkins. My favorite. 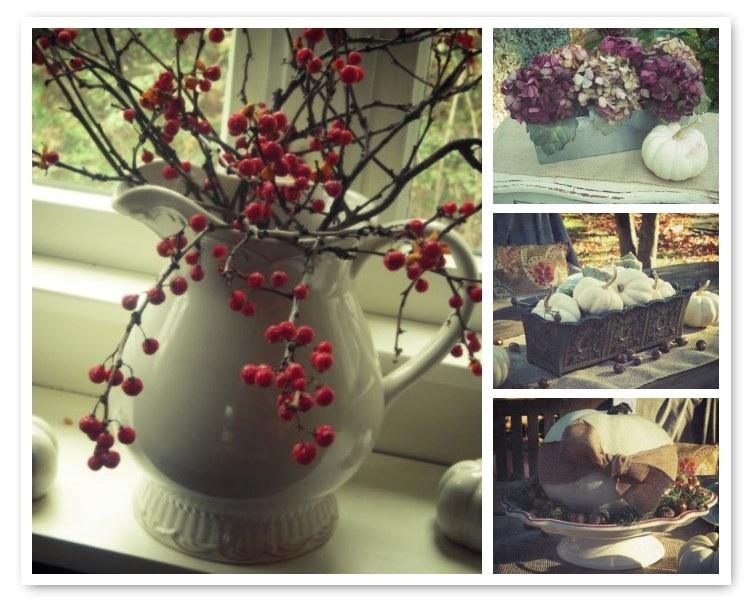 Bittersweet vine in a vase, hydrangea tin, planter filled with white pumpkins, white pumpkin tied with hopsack ribbon set on a serving pedestal with moss and gilded acorns. 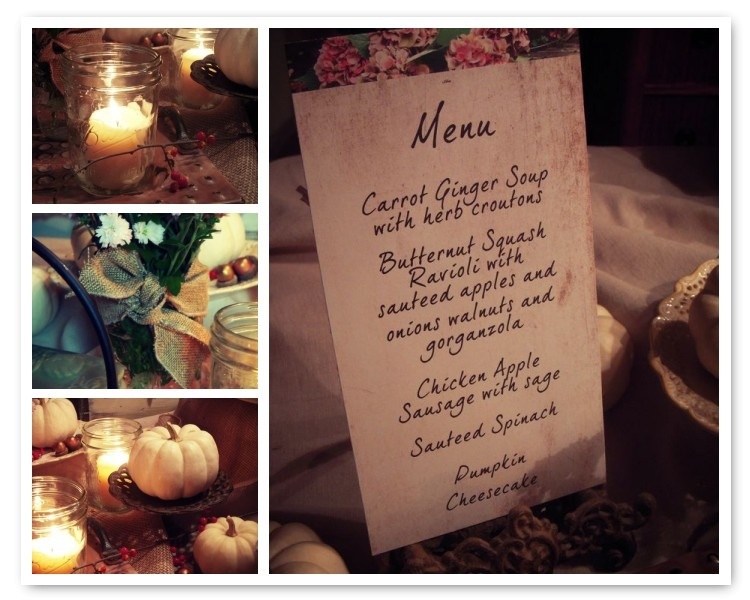 For the buffet table - take the time to print up a pretty menu - your guests would love to know what they're about to eat! Simple ball jar candles, or fill with flowers and tie with hopsack. 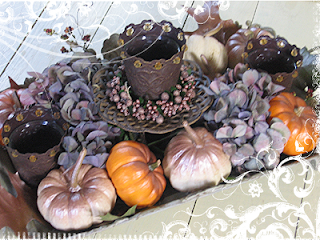 Pumpkins placed on candleholders, bittersweet vines here and there, more gilded acorns scattered throughout. 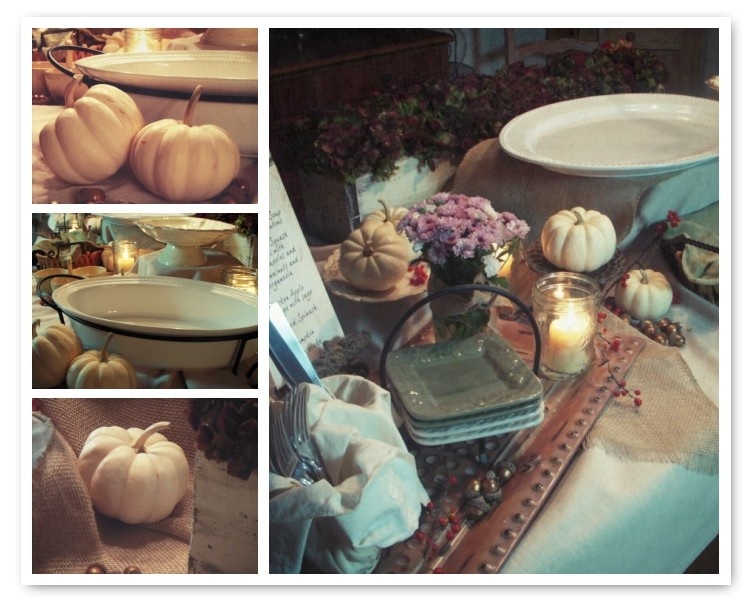 A buffet tablescape is easy to create. I always start with one tablecloth on the table. 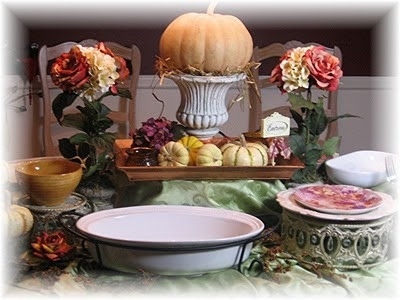 Place some hatboxes or similar item to raise some platters and create height on the table. Cover the lifts with a second tablecloth. On this table, I also placed some jute fabric over the top. I place all of my platters and serving pieces down first. Then the plates, silverware and napkins are located on one end all together - maybe on a tray. Additional ball jars, or mini urns can hold the utensils. Once all of the important pieces are placed, you start filling in with your candles, flowers and props. Just remember to be aware of candle placement and stretched arms (wouldn't want your guests' clothing to burn!). The first thing greeting your guests. What will it be? 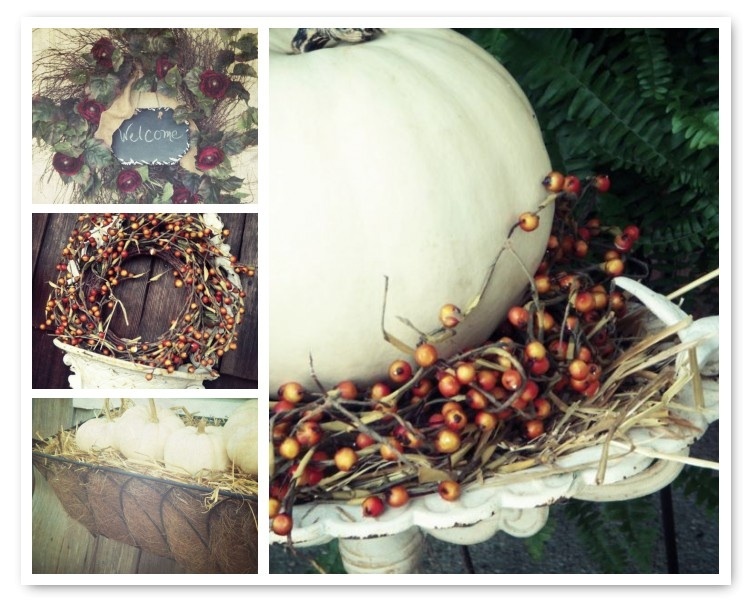 A welcome wreath, berries here and there, more beautiful white pumpkins on the porch and window boxes. Just cut open a small bale of hay and tuck some into your planters. White pumpkins and bittersweet. So pretty, inexpensive and easy! and a centerpiece tutorial HERE. Hope you found some new ideas today! This post is participating in the following blog link-ups. Today's Creative Blog - Get Your Craft On! so many beautiful images, love your pictures and style. 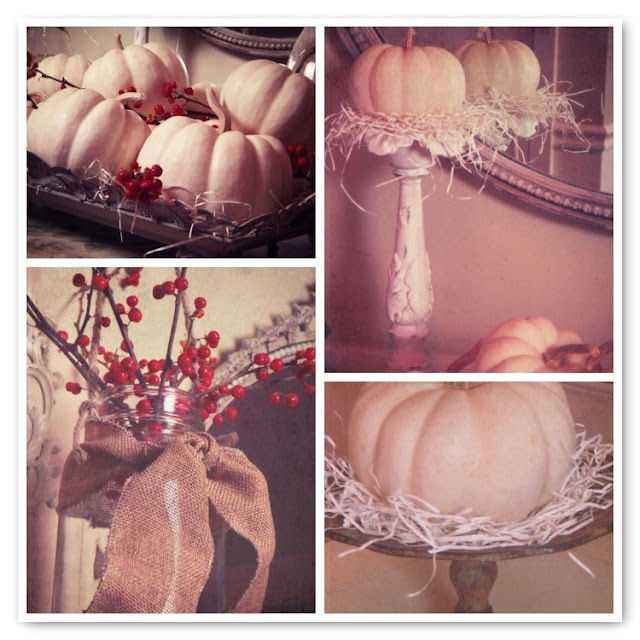 Lovely pictures, love the pumpkins and the menu - yumm!! Thanks for the tip on how to raise platters on a table I will use that next time we entertain. I enjoyed looking at these photos. I love combining natural elements on the table. Lovely! I'm a big, big fan of both hydrangea AND bittersweet, so this was right on for me! Have a Happy Thanksgiving! I look forward to seeing your Christmas post(s)! Very beautiful. Lots of wonderful ideas. Beautiful pictures! Happy Thanksgiving and thank you for sharing! Such a beautiful celebration of autumn. I hope you'll share your post with my meme Seasonal Sundays. Beautiful vignettes. I love all the ideas. great tip on watching the candle placements! I'm crazy about the u-tube slide show. Any hints for tutorials? Great job of photo editing. If you're a beginner you've done very well. You are the Queen of centerpieces, Dawn! They are all soooo beautiful! I love my Limelight hydrangeas, too. The way they turn that pretty green/pink/cream in the autumn is fabulous! And they're perfect for white vintage pitchers. :) Thanks for all of the inspiration today! Happy WW! Seasonal Idea Books - Coming Soon!